Changing atmospheric conditions are going to give El Nino the upper hand on weather trends once again as the month of February winds down and March begins. 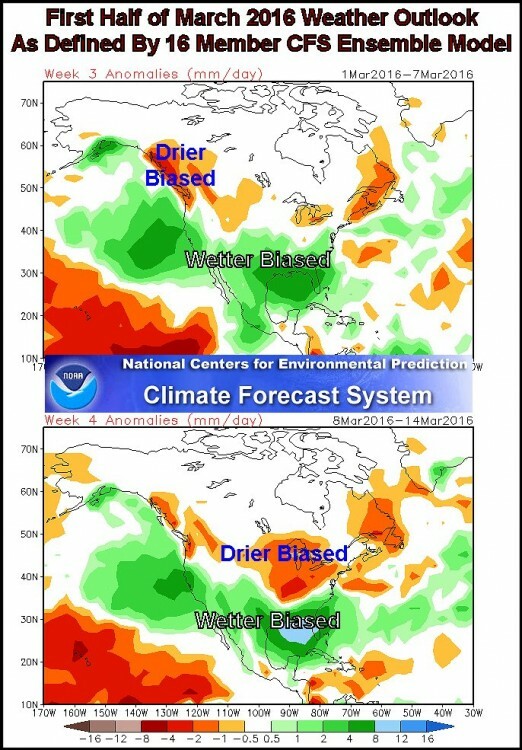 What is a traditional El Nino response? Well, here in North America it will include a wet bias across the southern United States and northern Mexico to start with. A frequent succession of storms is advertised for southern portions of the region beginning late next week and going deeply into March. These storms will carry large amounts of Pacific moisture inland through southern California and Baja California, Mexico. The storms will lose much of their moisture over the southwestern desert region and northern Mexico resulting in lighter rainfall in western and southern Texas and then the weather systems will attain Gulf of Mexico moisture to re-energize the precipitation potential as the disturbances continue to march east northeasterly through the Gulf of Mexico coast states and into a part of the interior southeastern states. In the meantime, the northern branch of the jet stream will see to it that very warm temperatures (that have already dominated western Canada and a part of the northwestern U.S. Plains) will expand back across southern Canada and the upper U.S. Midwest to the northeastern states. The return of warm air in these areas will likely be accompanied by less than usual precipitation. These changes will end the recent bout of cold weather that has moved through the eastern half of the United States. Cooler air masses will still come along periodically, but no long lasting bitter cold is very likely for a while. For other areas in the world, the changing influence of atmospheric patterns will be less visible. Western Canada will continue quite warm with a return to below average precipitation in the last days of February and the first half of March. Eastern Australia may struggle with dryness more often than over recent weeks and New Zealand may trend a little drier and warmer biased for a while in March. Drought in South Africa is expected to prevail for a while, although isolated to scattered showers and thunderstorms will continue periodically into the heart of March. Southeast Asia is expected to be influenced more by Madden Julian Oscillation (MJO) events than by El Nino and with El Nino continuing to weaken the odds are high that alternating periods of rain and sunshine will occur throughout Indonesia, Malaysia and the Philippines. Northeastern Brazil is expected to fall back into drier biased pattern for a while, but Argentina and most of Brazil’s main summer crop areas will continue to experience timely rainfall reinforcing the favorable production year that has been unfolding recently. West-central Africa may experience delayed seasonal rainfall in coffee, cocoa, sugarcane, rice and cotton production areas. The most interesting part of this ENSO update in found in information released over the past few weeks has been reducing the amount of cooling that will take place in the equatorial eastern Pacific Ocean over the next few months. The trend has been suggesting a slower and slower weakening trend in El Nino and this week’s data suggests that El Nino might continue as a very weak event into the summer. That could change some forecaster’s outlooks for doom and gloom. World Weather, Inc. sees no reason for a serious change in our outlook. El Nino will weaken enough that other weather patterns will take the lead for late spring and summer weather and we have already accounted for that. Founder, president and senior Agricultural Meteorologist. He began his career in 1978 as he participated in the International Monsoon Experiment (MONEX), an international effort to collect and process data from the tropics from Africa to Australia, the Philippines and China to improve forecasts for the Indian Monsoon. Receive detailed reports, special news stories, and other members-only content after you sign up.